January 6, 1875: Birth of Harriette Chick.“Dr. 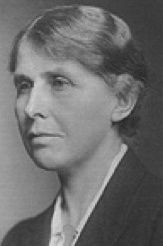 Dame Harriette Chick, DBE (6 January 1875 – 9 July 1977) was a notable British protein scientist and nutritionist. She developed the first relationship showing bacterial kill as a function of disinfectant concentration and contact time. Educated at Notting Hill & Ealing High School, She served as secretary of the League of Nations health section committee on the physiological bases of nutrition from 1934 to 1937. In 1941 she was a founding member of the Nutrition Society, of which she served as president from 1956 to 1959. Chick and Charles James Martin discovered that the process of protein denaturation was distinct from protein coagulation (or flocculation), beginning the modern understanding of protein folding. She is known for having formulated Chick’s Law in 1908, giving the relationship between the kill efficiency of organisms and contact time with a disinfectant. Chick’s Law was later modified by Dr. H.E. Watson in 1908 to include the coefficient of specific lethality. The Chick-Watson Equation is still used today. Chick’s Law-Basis of Disinfectant validation and D value. “In 1908 a British scientist, Dr. Harriet Chick, described a method for estimating the destruction of microorganisms by chemical disinfectants (Chick 1908). She postulated that the microbial mortality would follow what in physical chemistry would be called ‘first-order kinetics’—that is, mortality vs time data plots as a straight line on a semi-logarithmic graph. In practice, her postulate was correct and the law works for all liquid disinfectants and for many sterilization processes (for example, Chick’s Law has evolved into what is now referred to as D-value in autoclave sterilization). Reference: Chick, Harriette. (1908). “An Investigation of the Laws of Disinfection.” The Journal of Hygiene. 8:1 92-158. This entry was posted in Year 7 TDIWH and tagged Chick's Law, disinfection, drinking water, Harriette Chick, kinetics, public health, water, water history on January 6, 2019 by safedrinkingwaterdotcom. July 9, 1977: Death of Harriette Chick.“Dr. Dame Harriette Chick, DBE (6 January 1875 – 9 July 1977) was a notable British protein scientist and nutritionist. She developed the first relationship showing bacterial kill as a function of disinfectant concentration and contact time. Educated at Notting Hill & Ealing High School, She served as secretary of the League of Nations health section committee on the physiological bases of nutrition from 1934 to 1937. In 1941 she was a founding member of the Nutrition Society, of which she served as president from 1956 to 1959. This entry was posted in Year 6 TDIWH and tagged Chick's Law, disinfection, drinking water, Harriette Chick, kinetics, public health, water, water history on July 9, 2018 by safedrinkingwaterdotcom. January 6, 1875: Birth of Harriette Chick. “Dr. Dame Harriette Chick, DBE (6 January 1875 – 9 July 1977) was a notable British protein scientist and nutritionist. She developed the first relationship showing bacterial kill as a function of disinfectant concentration and contact time. Educated at Notting Hill & Ealing High School, She served as secretary of the League of Nations health section committee on the physiological bases of nutrition from 1934 to 1937. In 1941 she was a founding member of the Nutrition Society, of which she served as president from 1956 to 1959. This entry was posted in Year 6 TDIWH and tagged Chick's Law, disinfection, drinking water, Harriette Chick, kinetics, public health, water, water history on January 6, 2018 by safedrinkingwaterdotcom. July 9, 1977: Death of Harriette Chick. “Dr. Dame Harriette Chick, DBE (6 January 1875 – 9 July 1977) was a notable British protein scientist and nutritionist. She developed the first relationship showing bacterial kill as a function of disinfectant concentration and contact time. Educated at Notting Hill & Ealing High School, She served as secretary of the League of Nations health section committee on the physiological bases of nutrition from 1934 to 1937. In 1941 she was a founding member of the Nutrition Society, of which she served as president from 1956 to 1959. This entry was posted in Year 5 TDIWH and tagged Chick's Law, disinfection, drinking water, Harriette Chick, kinetics, public health, water, water history on July 9, 2017 by safedrinkingwaterdotcom. This entry was posted in Year 5 TDIWH and tagged Chick's Law, disinfection, drinking water, Harriette Chick, kinetics, public health, water, water history on January 6, 2017 by safedrinkingwaterdotcom. This entry was posted in Year 4 TDIWH and tagged Chick's Law, disinfection, drinking water, Harriette Chick, kinetics, public health, water, water history on July 9, 2016 by safedrinkingwaterdotcom. This entry was posted in Year 4 TDIWH and tagged Chick's Law, disinfection, drinking water, Harriette Chick, kinetics, public health, water, water history on January 6, 2016 by safedrinkingwaterdotcom.